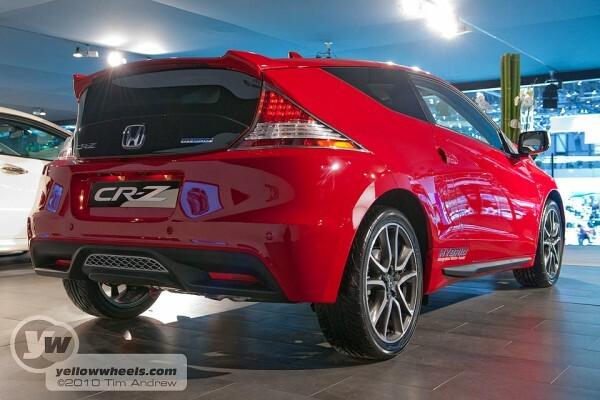 One of the cars we were eager to see in the flesh at the 2010 Geneva Motor Show was the Honda CR-Z. Would it look as sleek and purposeful as the Honda released press pics. Verdict: yes it’s refreshingly small and light looking. Many new cars have tended to bulk up their look, but this Honda flows, tilted from the back window forwards, with grill box low and lights pointing downwards arrow-like. The stance is that of a crouched animal, head down to minimise wind drag. The shape is uncontroversial and easily digested and should appeal immediately. 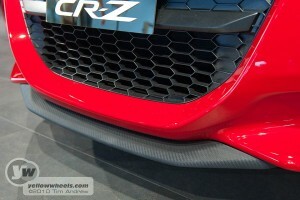 We were drawn to a red CR-Z complete with purchaser spec-cable carbon front chin and door sill addons, and 10 spoke alloys – much more inviting than the standard spec cars. Inside there’s a “carbon” look dash that wouldn’t look out of place on a Klingon starship, especially with the instruments lit up. It’s the sort of car you just want to get in and drive; it’s got enthusiasts DNA written all over it. Just a quick reminder though: it’s a hybrid, but that’s not what’s on your mind when you see it unlike Honda’s old 4 door Civic Hybrid. But you’ll like the claimed 54mpg and low CO2. The European CR-Z hybrid coupe will make its world debut at the 2010 Geneva International Motor Show in March. With sporty looks and agile handling, the CR-Z is the most exciting hybrid yet, promising driving thrills and a cleaner exhaust emissions package. The CR-Z’s compact 2+2 coupe body and striking design is coupled with a responsive chassis to give nimble handling and direct steering, and a 6-speed manual transmission enhances driving enjoyment. Its clean, efficient petrol-electric hybrid powertrain not only offers good fuel economy and a low exhaust emissions package, but also adds to the nippy driving characteristics of the car and means the CR-Z is well suited for use in urban environments. To maximise driver choice and enhance the day to day drivability of the CR-Z, it has a 3-Mode Drive System. This unique feature allows the driver to choose between three driving modes, which alter the responses of the throttle, steering, idle stop timing, climate control and the level of assistance provided by the IMA system. The 3-Mode Drive System allows the driver to choose whether they wish to maximise enjoyment, economy or strike a balance between the two. 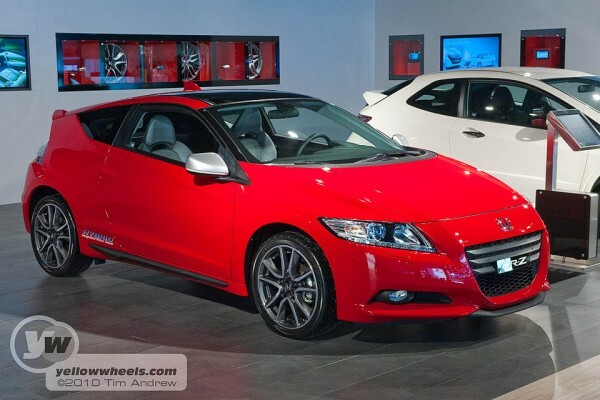 The aim of Honda’s engineers was to give customers more choice in how the CR-Z would drive, depending on their needs and desires at the time. Sport buttons have become commonplace in cars to offer drivers the choice between normal throttle response and a sharper response for more enthusiastic driving. Honda’s 3-Mode Drive System is far more than just a button to sharpen throttle response, with the behaviour of the hybrid drivetrain and the power steering assistance also changing between the three modes. When the CR-Z driver is away from the town or city and wanting to enjoy their drive, they can put the coupe into SPORT mode. This sharpens the throttle response, changes the behaviour of the IMA hybrid system to provide more electric motor assistance and increases the weight of the electric power steering. Our engineers recognise that even cars designed to excite the driver may still be driven in heavy traffic where enthusiastic driving is not possible, or desirable. In these situations ECON mode can be selected, which prioritises fuel economy in the operation of the drive-by-wire throttle, ECU, air conditioning and the hybrid system. At all other times the car can be run in NORM mode, which provides a balance between performance, economy and emissions and suits most driving situations. The ambient lighting of the speedometer is used in the same way as in the Insight, to guide the driver in driving more economically. 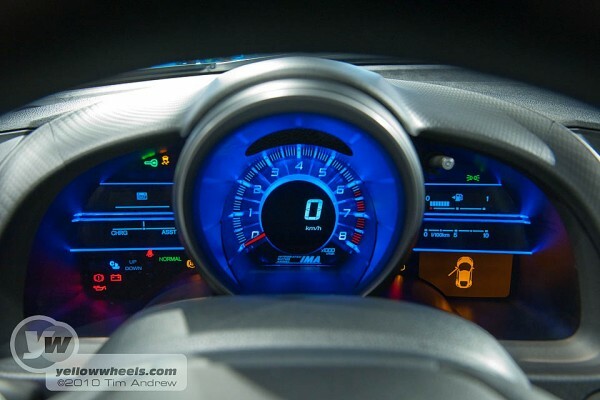 In addition to the Eco Assist function, the CR-Z’s meter lighting is linked to the 3-mode drive system. Changing from red to blue and then green depending on whether SPORT, NORM or ECON is selected. The CR-Z boasts a generous specification with all grades benefitting from six airbags, active headrests, Vehicle Stability Assist. All models also come fitted with Climate Control, 6-speaker CD player and an engine start button. S grades get heated door mirrors, rear dimming mirror, electric windows, daytime running lights, Shift Indicator Light (SIL) and auxilliary socket. Meanwhile, Sport grades have additional ambient lighting, alloy pedals, cruise control, leather gear shift, multi function steering wheel, parking sensors, privacy glass, 240W premium audio system, boot-mounted subwoofer and USB port for MP3 players. Top grade GT models are equipped with the above, plus full leather upholstery and heated front seats, panoramic glass roof, HID Xenon headlights, Hands-Free Telephone (HFT), and automatic headlights and wipers. GT models are available with optional DVD Satellite Navigation.